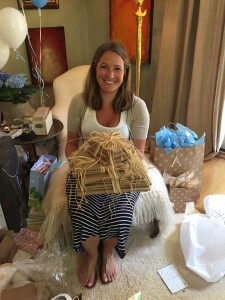 Years from now, when I look back at the pictures from Kara’s baby shower, I’ll remember the gifts, the décor and how beautiful Kara looked, pregnant with her first child. I’ll also remember it as the time I scheduled two parties in the same day and forgot until I looked at the calendar. I had 25 coming for the shower luncheon and 8 neighbors coming for an al fresco dinner. When I realized what happened, I thought, okay, I’m going to serve the same thing at lunch and dinner. That was the plan, but the plan morphed as the day went on. 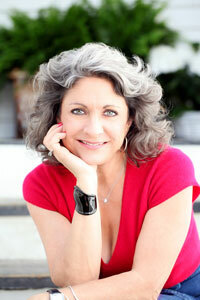 For the shower, Garnie, Quinn and I agreed to host together, but guess who was nominated to cook? I decided to make my version of a Pierre Franey shrimp salad recipe I’ve loved for years. Shrimp is one of a few fish dishes that can be served at room temperature, which makes it infinitely easier to prep. I paired it with celery, onion, shaved fennel, cucumbers, caper vinaigrette and feta cheese. Shrimp and feta is the exception to the rule of never pairing seafood and cheese. Something about it just works. I also did a green salad with buttermilk dill dressing and pasta, because Kara loves her noodles. I tried the pasta with lemon and parsley, but something didn’t work right the first time. So I kept adding oils and vinegars until it did. It all came off beautifully and when it was over, I looked around and thought, instead of repeating lunch, why don’t I just combine everything for dinner instead? I’d quadrupled the green soup I made for the Farmers Market demo and froze a few batches, so I defrosted that and used it as the first course. For dinner, I combined penne pasta with shrimp, added fennel, celery, Kirby cucumber, feta and covered it with vinaigrette. 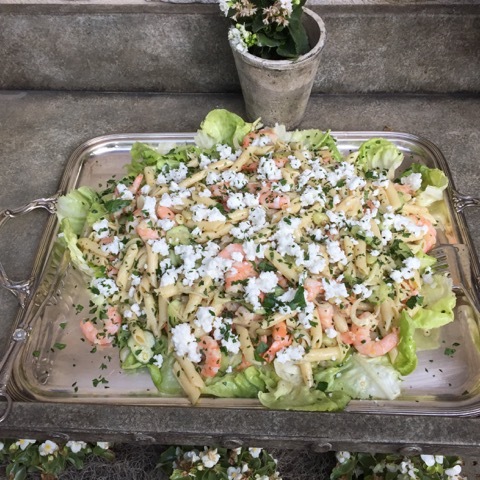 I even used the butter lettuces from the green salad at lunch as the base of the shrimp pasta salad. The buttermilk dill vinaigrette I did for the lunch salad wouldn’t have worked with the dinner pasta, so I combined white balsamic vinegar with Champagne vinegar, grapeseed oil and olive oil for the dressing. Again, it wasn’t quite right, so I added lemon juice and capers until it had some life to it. a lot of prep work the day before — it can work out beautifully. Every Saturday, from April to November, Selborne Green is alive with residents and visitors sampling their way around the Farmers & Artists Market. 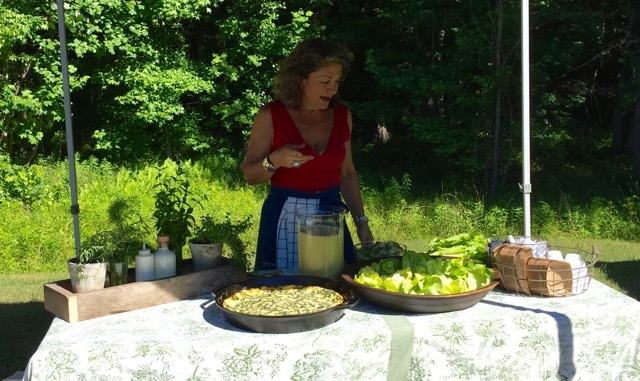 Serenbe Foods, The Hill and Serenbe Farms have tables alongside many other local vendors who sell everything from handmade cups to pickles and fried pies. I do a chef demonstration every year and always start the planning process with a visit to Farmer Ashley from Serenbe Farms. 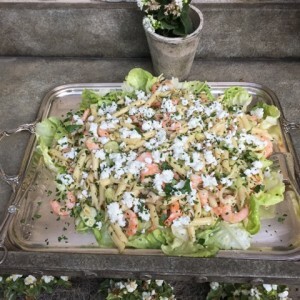 She had fennel and butter lettuce, so I did a salad with shaved fennel, cucumber, Vidalia onion, and a buttermilk, sour cream and feta vinaigrette I made ahead of time. I paired it with green soup — one of my all-time favorites. It makes wonderful use of the exterior lettuce leaves that aren’t as pretty as the interior ones and don’t make it into the salad. Instead of throwing them away, I blanch and freeze them until it’s time to make the soup. As many times as I’ve made green soup over the years, I’ve never served it cold. But the theme of the demo was summer entertaining, so I thought I’d give it a try. I filled a squeeze bottle with sour cream and buttermilk and did little garnish on top of each cup. It was fabulous and everyone loved it. 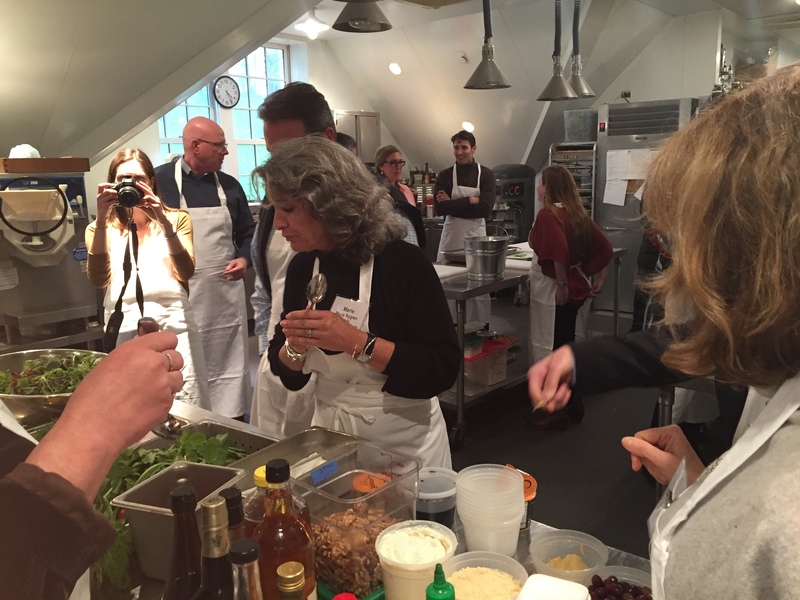 The participants learned a new recipe and I learned something new about an old favorite. Just as Steve’s Urban Land Institute meeting took us to New Orleans earlier this year, it took us to Tarrytown, New York last month for a forum on food and development at Stone Barns Center for Food & Agriculture. Most call Stone Barns a nonprofit farm and educational center. I call it a fascinating think tank for food. The facilities, once part of the Rockefeller estate, are exquisite. They’re overseen by Dan Barber, a chef/restaurateur, author and innovator in the food sustainability movement. Barber practices what he preaches at Blue Hill at Stone Barns and its sister restaurant, Blue Hill in Manhattan. Barber spoke at length about both food and sustainability and his mission to educate the world on what it really takes to grow food. His key issue was the health of our soil and the concept of rotational crops. For so many of us, food magically appears. We’ve gotten so far away from our food that we don’t understand what it takes to grow it. We demand so much of our soil that it gets depleted and won’t produce anything. The soil has to rest and be nourished. Crop rotation is a system farmers use to keep the soil fertile and avoid disease. It means not planting the same thing in the same place year after year to keep up with demand. It’s one thing to talk about it; it’s another thing to see it play out on the plate. Chef Barber served us his Rotational Risotto, which celebrates the lesser-known crops farmers plant in the rotational system. In this case, wheat is in demand, but it’s what he calls “uncoveted crops” — buckwheat, millet, rye, etc. — that nourish the soil so the wheat can shine. It gave me a whole new appreciation for the science of farming, the agri-industry and what life must have been like 200 years ago when people didn’t have access to most foods year-round. After the talk and tasting, we split up into three groups and rotated activities. 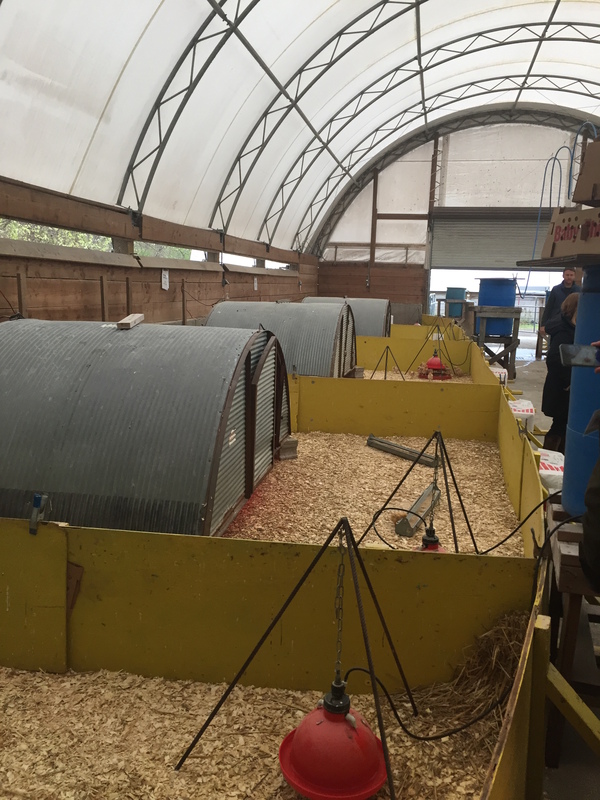 I visited the chickens and learned about two different types: the Cornish Crown and the Freedom Ranger. The Cornish Crown is the chicken most people eat because it’s genetically bred for breast meat and has very little bone to get the way of processing. By the time they’re eight weeks old, Cornish Crown breasts are so heavy they can barely walk. The Freedom Ranger is a heritage breed with a bonier skeletal structure. It was incredible to see them being raised side by side across the aisle from each other and taking in the differences between them at 3, 4 and 5 weeks old. 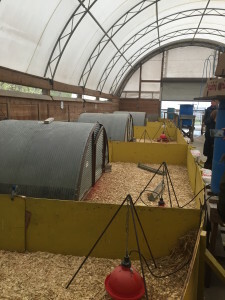 From there, I visited the hot house, where agricultural schools send seeds to see if they’re viable, and learned about different types of seeds. Then we came to my favorite part: food in action. Together with the culinary director at Stone Barns, I created a dish featuring every part of the radish. We made a salad with sliced egg, asparagus, a chiffonade of radish greens, pickled radish and a carrot yogurt dressing. The eating continued at Blue Hill at Stone Barns with cocktails, appetizers and a four-course dinner featuring a parsnip “steak” with bordelaise sauce and beet ketchup. After meetings the next day, Steve and I ventured into the city and saw three plays: Blackbird with Michelle Williams; The Humans, which was nominated for a Tony award; and The Woodsman. It was nice to get my NYC fix, but I’ve become one of those country people who doesn’t find the craziness of the city as endearing as I once did. I’m good for a couple years, then I’ll forget, go back and do it all over again. 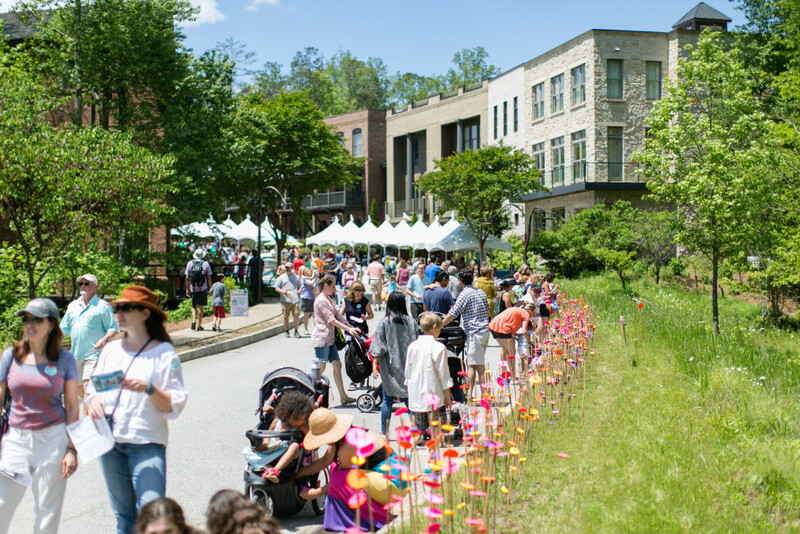 The 5,000 people who attended Serenbe’s May Day celebration this year saw our community at its finest. They strolled the sidewalks, enjoyed more than 50 vendors — including food trucks, roving performers and regional artisans — took pony rides and supported the Art Farm with their $5 admission fee. What they didn’t see is all the hard work happening behind the scenes. Long before 18 little girls and boys dressed all in white did their dance around the maypole, my daughter Quinn, Serenbe’s brand manager, and the entire marketing team were planning, plotting, delegating and making magic happen. Quinn does her job: She doesn’t talk about it, agonize over it, or go on and on about it — she just gets it done. And it was done beautifully. Even the weather cooperated with her: Earlier in the week there was an 80 percent chance of rain that day, but we never saw a drop.